Over the last month, AlphaSights has hosted 3 breakfasts with leaders of Corporate Strategy teams from over 30 companies in the Fortune 500. The geographical distribution spread from NYC to San Francisco and the companies ranged from multi-national beer distributors to bulge bracket banks, and yet, many attendees are grappling with similar challenges. 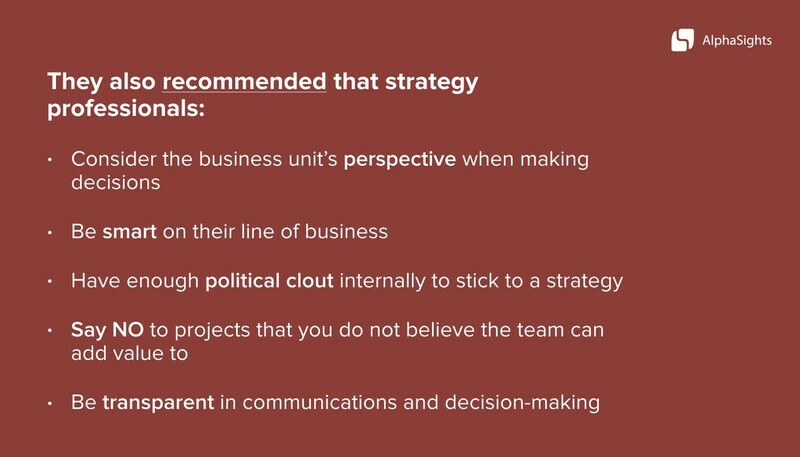 Corporate Strategy teams play a unique role that varies by each company; some receive projects from the C-Suite down, some choose areas they’d like to work on, and most often, they are requested by or assigned to help business units with identified areas of opportunity. Corporate strategy teams often have the difficult task of entering business units and changing operational procedures — whether the new direction is welcome or not. Anecdotally, we have heard time and time again this phenomenon be facetiously referred to as calling the groups’ baby ‘ugly’. 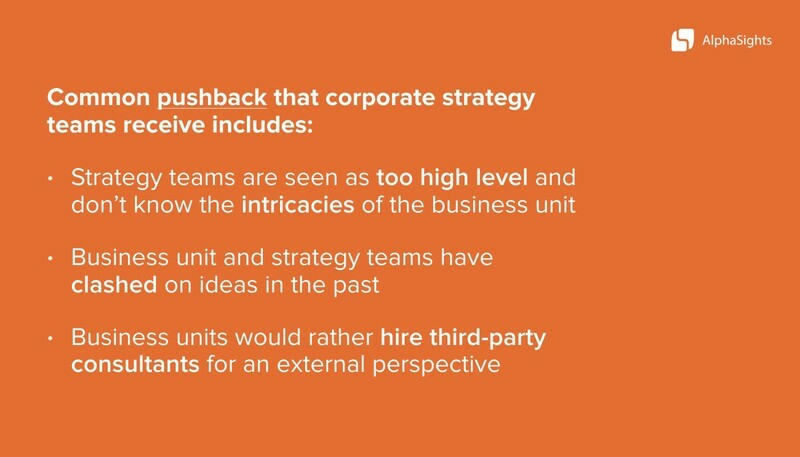 As you can guess, corporate strategy teams are not always welcomed by business units who have invested significant time and energy developing a strategy or product just to have it upended. Thus, many of our attendees found that business units did not always want their help on initiatives. While these reasons are valid, it’s also necessary to realize that business units are often deeply immersed in their own projects and fire drills making it challenging for them to manage both the day-to-day and the ‘big picture’ strategy. When these teams do find time to talk about how their initiatives align with the ‘big picture’ strategy, they struggle to develop ideas past the initial conversation as daily operations must take precedent. Attendees of our breakfast events spoke at length about how they personally navigate relationships between business units and strategy teams, admitting that it’s difficult to find the right balance between the two. Amongst the number of solutions proposed, everyone agreed that there needs to be a healthy respect between the groups. While not an exhaustive list of solutions, the groups agreed that sticking to these principles will help establish respect and a healthy working relationship between disparate groups. Trust and relationships are not established overnight; these suggestions take time and effort to achieve. AlphaSights is already helping with these considerations for our current clients. When strategy teams are assigned to a new business unit, they will often reach out to AlphaSights to interview former members of the business unit or former employees of competitors in that market vertical. By interviewing these individuals, the team is able to get smart on the challenges and opportunities so they are prepared and know what to expect. Outside validation through external experts allows our clients to understand a specific line of business to verify claims, and provide ‘fresh’ perspectives to the business units as they continue to consult for them. AlphaSights is a tool that excels at getting clients up to speed on a line of business and can test existing strategies vis-à-vis external perspectives without bias. We connect our clients with industry experts within 24–48 hours, allowing strategy teams to more efficiently work with business units and remain a valuable and respected resource. Pat McManus joined AlphaSights in September of 2017 as a Client Development Executive.